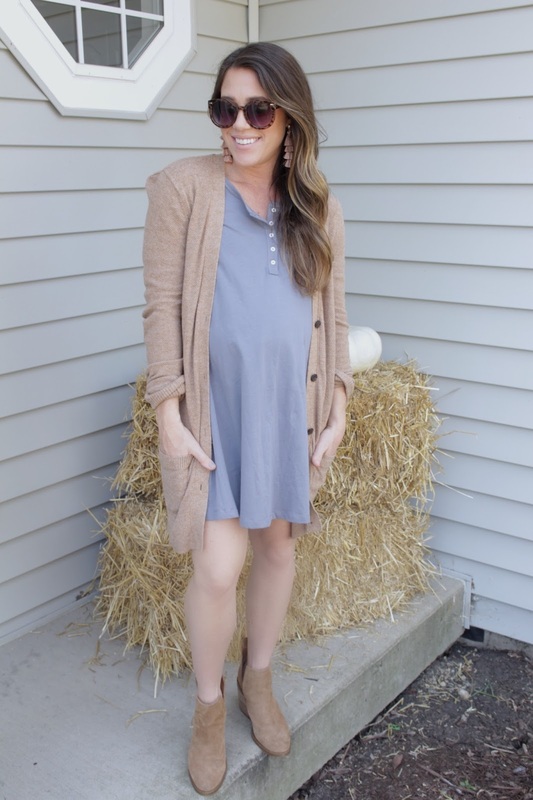 Dresses for Every Mama ~ Pregnancy, Nursing & Normal Everyday Life! Today I am sharing some dresses that Have It All. In this phase of my life, finding pieces that can do it all for me…are the most enticing to purchase. Being 30 weeks pregnant, I need something that can work with my 30 week bump, can be great postpartum nursing and also be great piece to have in my closet when I get back to my normal size!….You see I just want it all! but who doesnt!? Honestly, spending money on pieces that you will only need for such a short amount of time just seems silly as well! Therefore I wanted to share some great dresses! I think dresses are a perfect piece for maternity wear and just life in general especially one that is comfortable like THIS one. I absolutely love the material! It is soft and has a slight stretch. The A-line shape of it is perfect for a bump. The buttons on the front make it really great for nursing. Overall its a great piece for fall!! I paired it with my FAVORITE CARDIGAN and some booties! I got my normal size a small and fit is perfect! I also wanted to share other dresses that have it all….great for pregnancy, nursing and non-maternity normal size wear 🙂 Make sure to check those out below! I hope you all had a great weekend! Let me know if you have any great pieces that are so versatile!